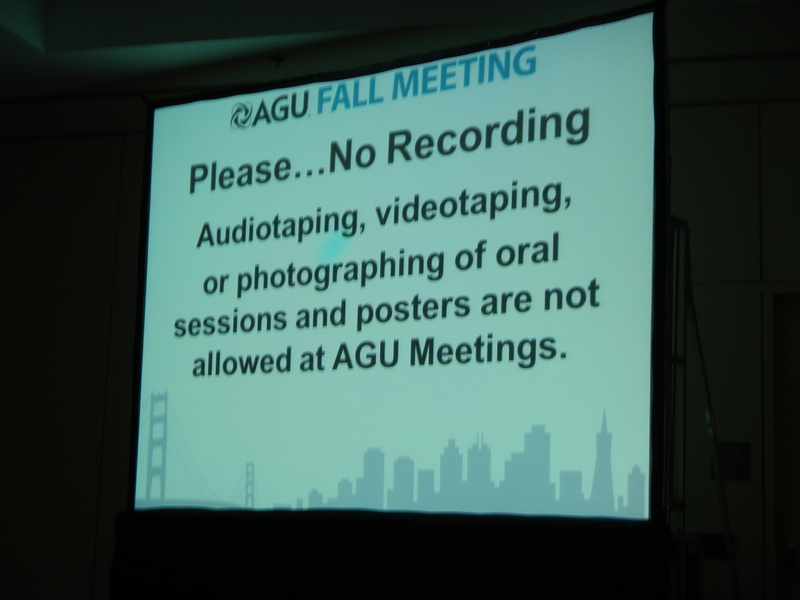 Today is the first official, full day of the AGU Fall Conference (even though events have been going on for the past couple of days). I kicked off the meeting today by co-leading a workshop with an amazing group of fellow faculty that are Councilors with the Geoscience Division of the Council on Undergraduate Research. The four-hour workshop, titled “Getting Started with Undergraduate Research,” featured 20 attendees (graduate students to new faculty) from the U.S. and other countries that were interested in hearing about how to work with undergraduate researchers, mentoring students at different stages of their undergraduate careers and on different types of projects. My contribution was to present on models of undergraduate research with freshmen and sophomores. Students in their first two years are certainly capable of engaging in research experiences, whether it be through course projects, community projects, or independent study projects. As you can imagine, I presented several examples of projects completed by Penn State Brandywine students! We also had some break-out discussions, and I had a great conversation with a faculty member from the University of Vienna in Austria as we compared the similarities to how students in both of our countries approach undergraduate research. I’ll insert here a quick note to my students… unfortunately, I will not be sharing any photos from sessions – as you can see from the photo to the left, no audio, photos, or video are allowed at the conference. But I’ll see what photos I can take to share as much as I can! After lunch, I quickly went through the Poster Hall to check out the posters on “Improving Student Writing: Methods You Can Use in Science and Engineering Classrooms Posters.” I learned about some very innovative models of designing writing courses and assignments in conjunction with campus writing centers and libraries. I look forward to following up online to explore the University of Oklahoma’s Geowriting course. Then, I “camped out” for the afternoon in back-to-back sessions on “Games, Interactive Simulations, and Virtual Labs for Science Teaching and Learning” (a listing of the talks can be found here). I took several pages of notes in this session, and I was really struck by the take-home message from almost every presentation – games can be all science and no fun, or vice-versa. Game designers need to get players excited to play the games, but not too excited so that learning does not take place – but not let players get too bored, either (yikes!). Designers need to find that balance between education and entertainment, and it is not an easy balance to attain or maintain. I need to go back and check out the games available from The PoLAR Hub (especially their EcoChains: the Arctic Crisis Card Game) and the Scripps Institution of Oceanography. I also enjoyed viewing the British 3D Type Fossil Database (and yes, we had 3D glasses in the audience to view the images – amazing!). It is not very often (if ever) I hear virtual games mentioned at a scientific conference, such as Pong, Angry Birds, and Farmville – it provided an interesting context for why as scientists we should seriously consider tapping in to the gaming audience that already exists. To end my Monday evening, I attended AGU’s film screening of the film documentary Thin Ice. I saw the review on the RealClimate website, and then when I saw AGU’s tweet as a reminder, I made sure I headed back to Moscone South for the event. I thought this film did one of the best jobs of explaining climate science, something that I know I want to share with not only my students but with the middle school Earth Science teachers I work with back in Pennsylvania. I also felt that the preview does not do the film justice – I was not “sold” on watching the film when I saw the preview a few months ago, but I’m so glad I attended this evening. During the Q&A, I learned that the film took six years to make, and the 73-minute length means that the film will most likely not be televised (PBS, for example, wants 56 minute movies). The audience had some questions if the title was appropriate (since “thin ice” specifically is not discussed in the film), but the group also applauded how the film does an excellent job capturing the process of doing climate research. As I prepare to work hard and learn much at the NASA Social and AGU Bloggers Forum tomorrow, I’m reminded by tweets that my colleagues and students will be taking a day off!